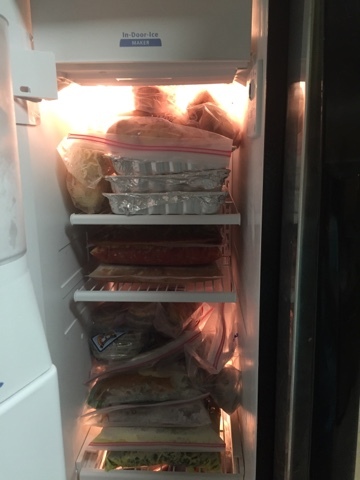 This weekend was our second attempt at bulk cooking. This time we made more dinner meals than anything else... I got two recipes of breakfast items in there too, but that wasn't my focus other than getting something made for John to be able to grab and take with him to work. This time, I made more soups which we will love as things start to cool off for the fall -- hopefully in the next month. If not, who doesn't love a good soup? - Impossible Egg Muffins - he got 8 days worth on this taking 2 a day. I'm going to make some more today. - Coffee Cake Muffins - 18 muffins, but this is made from stuff I have on hand -- so we can make more when these run out. Friday - I went on my big Costco run after John got home. It was ridiculous, I had to use a flatbed cart! I wasn't sure it would all fit in the car! Saturday - Was prep day, but I needed a few items at HEB that I didn't get at Costco. So we went and did our Lowe's Build and Grow workshop, then ran to HEB on the way home. I spent the afternoon/night prepping as much as I could for the bulk shopping day. I left about 3 things to be completed during the cooking process. Sunday - I started at 10:30/11:00 AM and finished cleanup at 10:00 PM -- so I'm calling it 11 hours. I took two short breaks to eat lunch and dinner (I'd say a total of 40 minutes)... but other than that - I was in the kitchen cooking. Is it worth it? I say yes -- now for the next 38 nights -- I don't need to do any prep for dinner other than putting together side dishes for the meals. I've got everything done, and I can menu plan based on what is in the freezer. Grocery shopping ought to be a very small list -- just toiletries, veggies, fruit, and replacing lunch items like: bread, Nutella, lunch meat... just very simple. I'm doing an experiment to see how much we spend this month, and analyzing if it's significantly less than other months. Regardless, it's very freeing to me to have this long list of things to choose from for meal planning instead of pouring over Pinterest each week looking for new items to try. 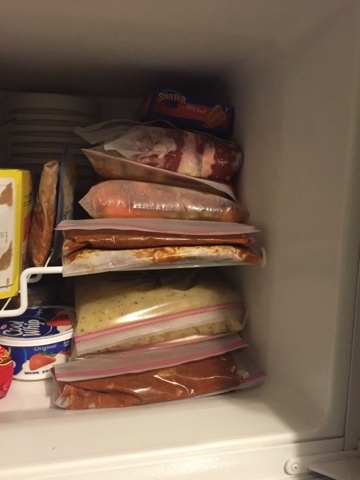 Some of these things are repeats from last month: The Chicken Bruschetta, and the Beef Enchiladas - we revamped this one a little to make them stand up to freezing better. We fried our corn tortillas for about 30 seconds to make them a bit leathery -- then dipped them in enchilada sauce and rolled the filling in. Want to join in this fun with me? I'm telling you -- I've done a few things in the last month that have literally changed my life. 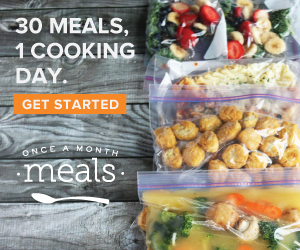 1 of those is joining in this Once a Month Meals movement. Go back and check out my other posts about it and see if it's something for you! Here is a list for you: Planning, Shopping, Prepping, Cooking.